Custom Printed Retro Spirit Sunglasses are coming with UV400 protective lenses to give the customers a superb experience in the harshest sunny conditions. Organize activities and events in bright sunny days without worrying about the sun, when you have these custom retro sunglasses with you. Available in 8 attractive color options, these custom sunglasses consists of a White arm by default. These sunglasses with an overall size of 6" H X 0.5" W comes with UV400 protective lenses and also 0.38" H x 1.50" W imprint area per side. Order now to win free artwork design and fast turnaround times! 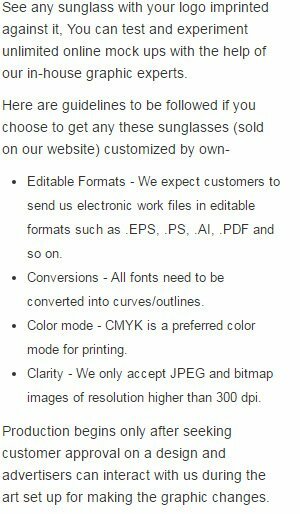 Request a quote to know wholesale savings for these Custom Printed Retro Spirit Sunglasses.